Hello everyone! Giovanni aka The Sniper Troll here. Some of you might know me for my personal Ashes: Rise of the Phoenixborn blog, Shifting Mists, where I ramble a lot (well, not much since it’s been online for just a few weeks now) about the game and what I think of it. Some time ago Brendan asked me if I wanted to join the crew here at Strange Copy and help develop some content for the community, so here I am with this new series, the amazing, incredibly useful ultra-pretentious and hopefully-not-boring Sniper Troll’s Rules Corner. As a personal preference, I like games whose rules framework is as light as possible. The less convoluted rules are, the easier for players to learn them, and to use them as a tool for unwrapping and resolving the most complex game situation. 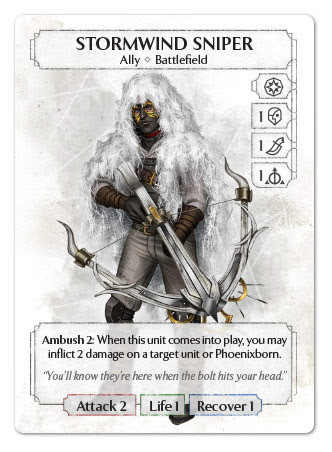 Ashes does a great job with that: the rulebook is concise and well written, moving most of the complexity on the interpretation of the cards themselves. As it attempts to be a valid competitive game, however, Ashes needs a solid (but still as lightweight as possible) set of rules for governing the interaction of multiple effects, regardless of their complexity, that can lead to unambiguous interpretations in tournaments. Hence the FAQ. Now, trolls are notorious for three things: they regenerate, they will eat anything, and – especially those living in the web – they love arguing. A lot. What does it have to do with Ashes? you might ask. As a game-loving troll myself, I am pretty used to arguing and I have eaten countless rulebooks in my gaming career, so I’d like to lend my somewhat dubious expertise to the Ashes community the best way I can: by digesting the rulebook and FAQ in an attempt to help you understand the finest points in the rules and, hopefully, the reasoning and philosophy behind those rules. Before we begin our exploration of the game mechanics, allow me to thank Robert Klotz, Ashes lead playtester, who has been so kind to review this article and offer some insight on the finer aspects of the rules I might have missed. Unless I explicitly state that what I’m writing is my own personal interpretation (thus not 100% reliable), any piece of information you’ll find here comes either from the rulebook, the official FAQ or has been suggested/confirmed by Robert, so it should bear a certain degree of authority. I agree, I already wasted a huge amount of your precious time with my absurdly verbose introduction (because I know that’s what you are thinking!) and now need to get to the point of my first post in this series, which is the resolution of game effects. So, enough rambling. Really. Let’s roll those dice and begin! Now, before properly delving into game effect resolution, let’s quickly see how these effects are written on the cards themselves. The cost to play a card is indicated in the top-right corner of the card, under the title, type and placement sections. If a card is an Action Spell or a Reaction Spell you’ll resolve the effects of that card when you play it, after you have placed it in your discard pile. A Reaction Spell will also list one or more triggering conditions that must be verified in order for you to play it. Ready Spells, Allies and Alteration Spells don’t usually have effects that happen when they are played. There are some notable exceptions, like the Stormwind Sniper, but these are explicitly written on the card; most of the times, these cards have abilities printed on them that you can use by activating them. Other abilities, instead, provide a constant effect and don’t need to be activated in order to be used. Abilities that don’t require an action to be activated. There’s currently 1 activated ability that doesn’t require an action: Throw 1 found on the Anchornaut. It’s written as “During your turn, pay cost X to do effect Y”. “When event X happens (or would happen, or after it happens), you may pay multiple cost Y’s. For each Y paid, do effect Z. 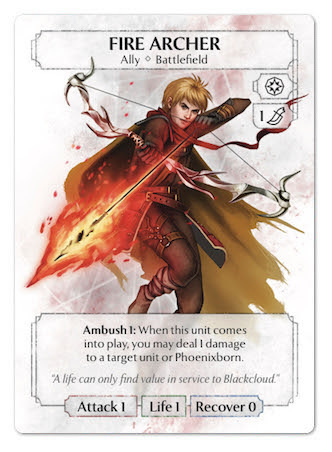 Abilities printed on Phoenixborn, units, and some alterations are identified by their ability name printed in bold (i.e. Battle Advantage, Slash, Ambush 2), possibly including a number. The number is used as a quick reminder of the “magnitude” of the effect (i.e Ambush 1 vs Ambush 2). Abilities worded like this add those “magnitudes” together if the unit gains the ability again. This is the only way a unit gains extra effect from gaining an ability it already possesses. Resolve the effect by following the instructions of the card. Usually, this declaration-resolution process is straightforward. If nothing intervenes, you declare the effect you wish to play and resolve it. But if life were so easy, there would be no need for the Sniper Troll to step in. Many situations arise in the game where this simple process is complicated by the interaction of various card effects. This will be addressed in a later article, don’t worry. For now, let’s pretend things go smoothly. You have declared your intention to play a game effect and now proceed to its resolution, starting with paying its costs. What constitutes the cost of an effect? Page 10 of the Ashes rulebook defines five possible types of costs, that can be – and often are – combined together. Exhaustion: in order to pay an exhaustion cost, its controller places an exhaustion token on the respective card. It makes no difference whether the exhaustion symbol is printed on the card, or the sentence “place an exhaustion token on this card” is used. Whenever you exhaust a card to use its ability, you are paying an exhaustion cost. 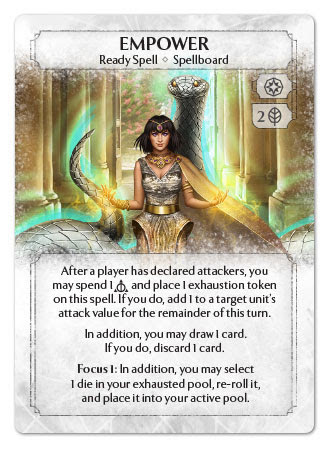 Note that if the card makes you place an exhaustion token on another card you control, most likely as a prerequisite for another effect (i.e. focused Small Sacrifice), that is still part of the effect of that card, and not of its cost. Only exhausting a card whose ability you are activating is considered part of its cost. 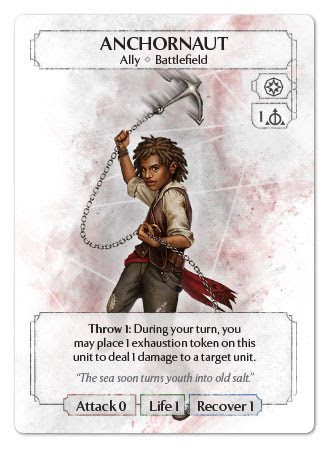 Fun fact: you are placing an exhaustion token as part of the cost, thus before resolving the effect of the ability. Even if the card is exhausted and thus considered without the ability, you are still entitled to resolve it (there would be no point otherwise). Basically, the effect of exhaustion is to prevent abilities from being played outright, not abilities that have already being played from being resolved. 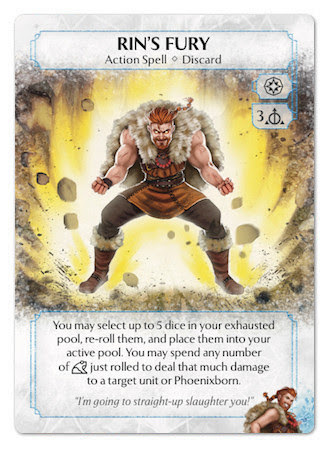 Main Action or Side Action: in order to pay a Main or Side Action cost, you must spend the relevant type of action for your turn. Obviously, you may only do it if it’s your turn, and you may not spend a Main Action instead of a Side Action or vice versa. Some effects (i.e. Anchornaut) won’t require any action as a part of their cost, but they are not considered reactions, since they lack a trigger. You can play as many effects not requiring an action as you like in a turn, in addition to your normal Main and Side Action allowance. Discard: in order to play a Discard cost, you have to discard 1 or more card from your hand. Note that cards discarded as a part of the effect resolution (i.e. Empower) do not count as part of the cost of the effect. Magic: magic costs are represented by the relevant Magic symbols on the card itself. For each dice symbol indicated in the magic cost, you must exhaust an active die showing a face of the same or higher value. As with exhaustion cost, it doesn’t matter if the magic symbol is printed at the beginning of the effect line or is contained in a sentence like “you may spend X to…”. 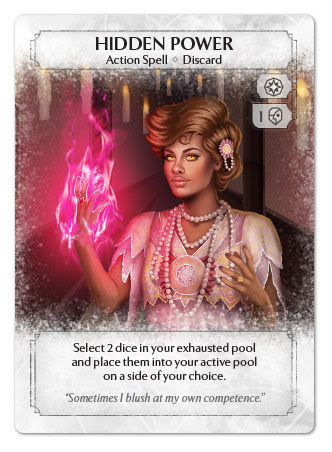 As dice are exhausted as part of the magic cost of a card, an effect, like Hidden Power or Rin’s Fury, that allows you to move dice from the exhausted pool to the active pool can interact with the dice you have exhausted to pay its cost. Game elements different from these five are never considered costs, unless accompanied with the phrase “as an additional cost”, although sometimes the wording of the card could make you think otherwise. 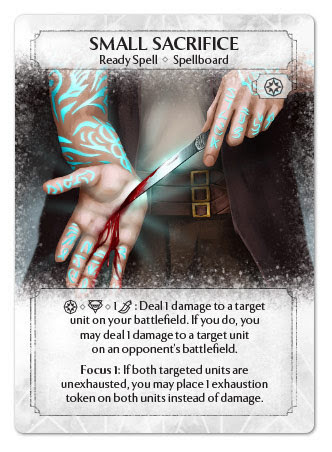 For example cards like Cut the Strings, Blood Transfer or Brennen Blackcloud all include a sentence that reads “Do X. If you do, you may do Y”. Although “X” might seem a cost, it is indeed part of the effects. This is important for the cancellation of effects, that we’ll see later. We’ll also see how, if an effect prevents you from paying the cost of a spell, ability or dice power, the effect you wanted to play is not resolved. But that’s a more complex topic that we’ll address in a future article. For now, let’s assume nothing interferes, costs are paid, and the resolution process goes on. Target: A term that is used to identify that the effect of a spell, ability or dice power is directly affecting something (including, but not limited to, an alteration spell, a unit, a player, or a Phoenixborn). Note that if the effect of a spell, ability or power doesn’t use the word “target”, then it has no target (this is only explicitly stated in the clarifications for Golden Veil in the FAQ, but it’s a safe bet that is a general ruling). Sometimes cards with more complex effects have the word “target” used only in some parts of that effect. It’s the case of Coal’s One Hundred Blades, which reads “Deal 1 damage to a target Phoenixborn. Deal 1 damage to all opponents’ units. Draw 1 card.” One Hundred Blades affects the chosen Phoenixborn and all the units in the opponents’ battlefields, but only the Phoenixborn is considered a target for that spell. This means that Golden Veil cannot cancel its effects, because its triggering condition is “when an opponent uses a spell, ability or dice power that would target a unit you control”. Similarly, Alteration Spells are attached to units. 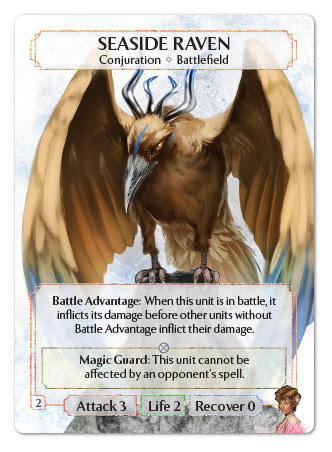 They affect a unit they are attached to (this is important for units like the Seaside Raven, which can’t be affected by opponents’ spells – including Alteration Spells), but don’t target it. 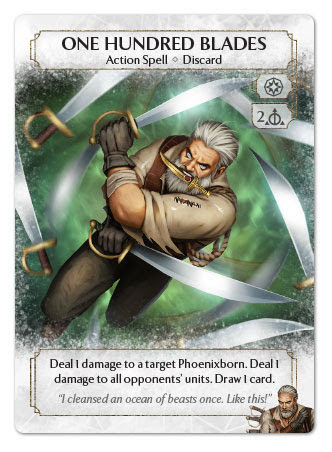 If a card reads “You may do X to target unit/Phoenixborn/card”, the option offered by the verb “may” only refers to the resolution of the effect: If an effect has a target, choosing a target is mandatory. For example when using Rin’s Fury, which reads “you may spend any number of Nature Power symbols just rolled to deal that much damage to a target unit of Phoenixborn”, you must choose a target first, and then you have the option to deal damage to it, if you rolled any frogs (but note that you will have to choose the target before rolling the dice). On the other hand, if an ability/spell/power – or part of it – requires a target and there is no valid target in play, you can still play it, but the effects that don’t have a valid target won’t resolve. Another example: Lulu Firststone’s Phoenix Barrage reads “Deal 4 damage to a target unit. Deal 2 damage to a target Phoenixborn”. 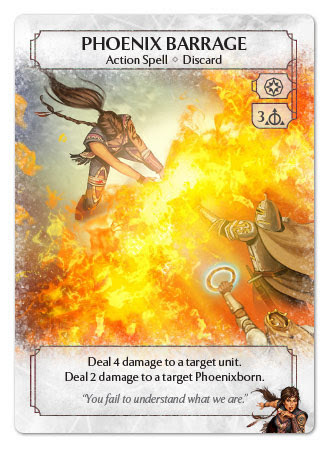 If one or more units are in play, you have to choose one as a target of the 4-damage effect, and a Phoenixborn as a target of the 2-damage effect. If no units are in play, you can still play Phoenix Barrage, ignoring the unit-damaging effect since it has no valid target, and only choosing a target Phoenixborn to take 2 damage. Ready Spells go into your spellboard, up to your Phoenixborn’s Spellboard value. Remember that multiple copies of the same Ready Spell get to focus that spell when played, instead of filling a separate slot in your Spellboard. 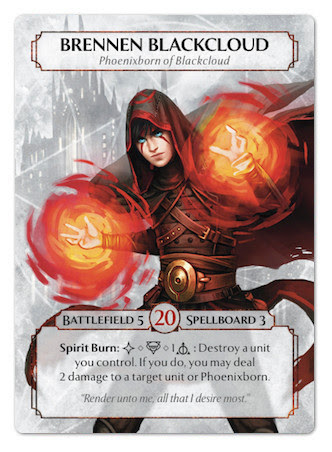 Allies and Conjurations go into your battlefield, up to your Phoenixborn’s Battlefield value. 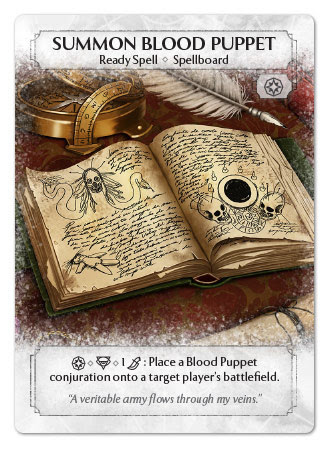 There is a notable exception, the Summon Blood Puppet spell, which allows you to place Blood Puppets in any player’s battlefield. Action Spells and Reaction Spells go into your discard pile. Alteration Spell attach to whatever game element is listed in the placement section, usually onto a unit. This doesn’t take up a “slot” if the game element is limited (i.e. an alteration attached to a unit doesn’t take up a battlefield slot). Remember that if your Spellboard or Battlefield are full, you can’t voluntarily “make room” for a card you want to play by discarding other cards, unless a game effect (i.e. meditate from your Spellboard) allows you to do so. When you place a card in another player’s play area (in their battlefield or attached to a unit they control), that players becomes the controller of that card: any ability or effect on that card addressing to “you” is referring to that card’s controller, and – unless specifically stated – that player is the only one who can activate the abilities on the card. 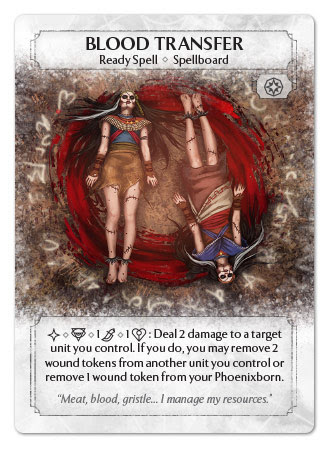 Cursed 1: At the end of each round, place 1 wound token on your Phoenixborn. Self Inflict 1: [Side Action] * [Basic]: deal 1 damage to this unit. 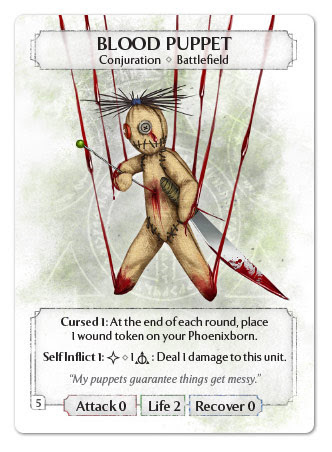 In the text of Cursed, “your Phoenixborn” refers to the Phoenixborn controlled by the player that has the Blood Puppet on his or her battlefield, and similarly, that player is the only one entitled to activate Self Inflict. 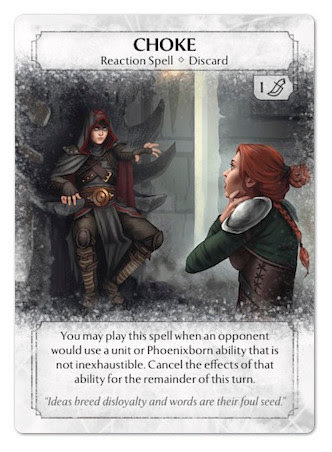 However, when you play a card under another player’s control, you are still that card’s owner since it came into play from your hand, deck or conjuration pile, so when it will leave play it will go to your discard pile or conjuration pile. And here we are. Costs have been paid, targets have been chosen, the card has been placed. After this ordeal, at last, we get to resolve the effect. You do what’s written on the card. Well… most of the times, yes, it is that simple. But there are some fine points that – since they have been explicitly addressed in the FAQ – I’d like to talk about, namely for what I dubbed (for the lack of an official term), partitioned effects. Most cards have a single effect. Those are straightforward and boring, and are not of our concern. Some cards, however, have a partitioned effect, i.e. an effect that is indeed composed of many individual effects. It doesn’t matter if those effects are separate sentences in the same paragraph, or are in separate paragraphs: they are all part of the same partitioned effect. When resolving a partitioned effect, you have to resolve the individual effects listed in order, from top to bottom. You can’t choose the resolution order of those effects as they are not simultaneous. Any reaction that may trigger from one of those individual effects, however, will have to wait until the partitioned effect is fully resolved. When you resolve a partitioned effect, you check for the conditions to play each individual effect separately. Any individual effect that can be resolved must be resolved (unless it uses the expression “you may”, in that case the effect is not mandatory and you have the choice not to execute it), while any individual effect that cannot be resolved is ignored. Pay Costs: Place an exhaustion token on the Summon Gilder card, spend your Main Action for the turn, and exhaust a dice showing a Nature Class symbol (or a Nature Power symbol in its stead). Choose Targets: Since Summon Gilder has an effect that interacts with a target unit, you have to choose it now. Note that (1) if the only units in play are in your battlefield, you must choose one of them as the target and (2) if there are no units in play when you activate Summon Gilder, you won’t be able to deal 1 damage to the Gilder you are going to summon with this spell, as there won’t be any legal targets to choose when the ability is activated and the “Choose Targets” step will be skipped. Place Card according to Placement Section: Summon Gilder is already in play when you resolve its ability, so this step is ignored. Note that while its effect instructs you to place a Gilder onto your battlefield, this is done in the effect resolution step, because this step only refers to the card whose effect you are resolving itself. 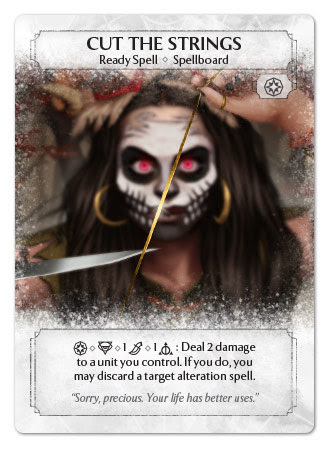 Resolve Effects: Since Summon Gilder has a 2-part effect, first of all you place a Gilder conjuration card onto your battlefield, then you can choose whether or not to deal 1 damage to the target unit you chose. Note that if you are prevented from placing a Gilder (i.e. because your Battlefield is full), you still resolve the “you may deal 1 damage” effect. Pay Costs: Exhaust a dice showing a symbol of basic value or higher and place an exhaustion token on the Empower card. Place Card according to Placement Section: Empower is already in play when you resolve its ability, so this step is ignored. 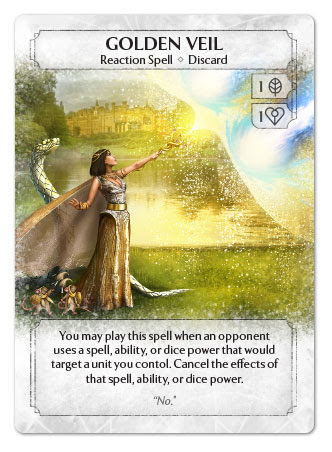 Resolve Effects: Empower has a 2-part effect (3 parts if focused), so you resolve each individual effect in the listed order, with the first effect increasing the attack value of the unit you chose by 1. Only this effect is mandatory, while the other two effects are optional since they include the expression “you may”. Note that you choose whether to resolve each of these two effects after the previous has been completely resolved, so you may choose which die to take back and roll from your exhausted pool after seeing the card you draw (if, hypothetically, the last effect were written as “you may select 1 target die in your exhausted pool”, you would have been forced to choose which die to roll before having the option to draw). Summon Dread Wraith is an example of a ready spell that has a single effect, which becomes a partitioned effect once the spell is focused twice. We won’t go again through the effect resolution procedure, as I know you already have it. 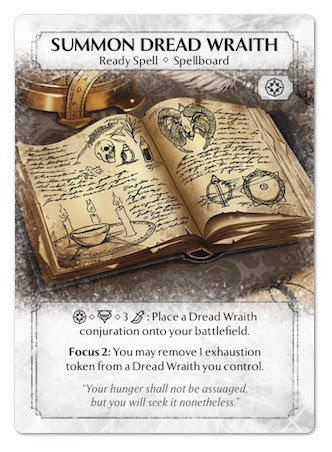 What I wanted to point out is that, because the Dread Wraith has a Conjuration Limit of 2, it’s quite likely that, by the time you have all the three copies of Summon Dread Wraith in your spellboard, both your Dread Wraiths will be in play. 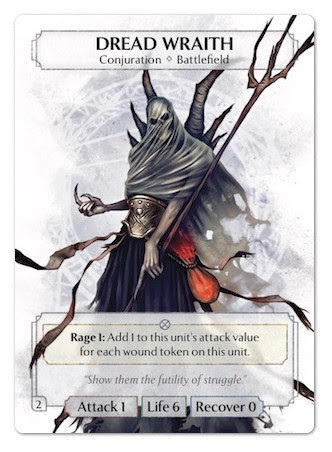 In this situation, you could still activate Summon Dread Wraith, pay its cost, and resolve only its second effect, that allows you to remove an exhaustion token from a Dread Wraith you control. Some cards provide you with reactions that make you cancel the effects of a spell, ability or dice power that has just been played. We’ll see in a future article when and how these cards (and reactions in general) are played, and we’ll return to this topic more in detail. For now, I’ll just give a brief overview of what happens when an effect is cancelled. Essentially, effect cancellation prevents the fourth step (resolve effects) of the effect resolution process, while it doesn’t affects the previous steps, so if an effect you wanted to use is cancelled, you would still pay all the costs, choose a target and place the card according to its placement section, then the effects of the card are cancelled and don’t take place. Note that when all the effects on a card are cancelled by an opponent, even those affecting your units or cards are cancelled. For example if an opponent uses Golden Veil to cancel your use of Small Sacrifice, your unit won’t suffer damage (or be exhausted) as well as your opponent’s. At the moment, the only cards with cancellation effects are Golden Veil and Choke. Both cards read “Cancel the effects … ” so, in the case of a partitioned effect, they indiscriminately cancel each of the individual effects that ability would have resolved (i.e. 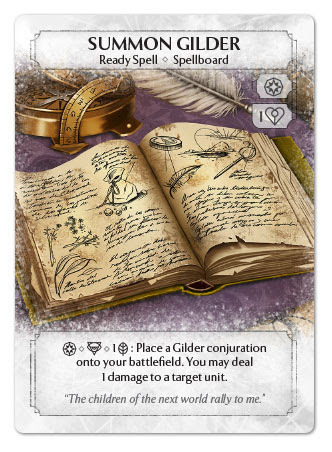 if I were to use Summon Gilder, targeting an enemy unit to take 1 damage, and my opponent played Golden Veil to cancel its effects, I not only wouldn’t be able to damage the enemy unit, but I wouldn’t also place a Gilder on my battlefield). I don’t know if in the future cards will be released that only cancel a specific kind of effects. If they will, I presume only those kinds of effects would be affected, while other effects would be resolved, but that’s just speculation. And that’s all, for now. I hope this article helped you to get some more insight into the game mechanics. Next time, we’ll delve into a more complex topic: the timing of effects and the resolution of reactions. Anchornaut’s ability should be a side action in my opinion. 95% interactions with other cards would be much simpler. In the current form it creates too many rule uncertainties.